Low-volume, high-mix discrete manufacturers convert assembly lines in hours—even minutes—to accommodate different production requirements. Their assembly lines can run a few days or a few shifts, making even the smallest of errors large enough to ruin output and cut into profits. Add such losses to the tremendous amount of scrap and waste that manufacturers write off as the cost of doing business, and one can see how improvements in efficiency can save millions of dollars. That’s why it’s no surprise that 68 percent of executives responding to a recent McKinsey global survey said their organization considers “Digital Manufacturing” a top priority. And so from the plant floor to data analytics and everything in between, manufacturers are investing in new technologies that enable them to increase plant efficiencies and improve remediation. For example, using real-time analytics, one plant optimized its metal spray process, reducing defects and rework—increasing first-pass yield from 35 percent to 96 percent and saving the business $500K annually. Another optimized its diaphragm manufacturing—reducing scrap by 40 percent and increasing yield by 47 percent. The company realized $900K in OpEx and significantly increased capacity—all through deploying real-time analytics in its legacy plant. To achieve these types of operational improvements, manufacturers need to gain control over all of the data produced on the factory floor, from legacy machines to cutting-edge devices. No easy task, when one considers that most industrial equipment is not designed to share data for real-time viewing and decision-making. Specialized developers are bringing their knowledge of industrial processes, AI, data systems, and Time-Sensitive Networking (TSN) to create sophisticated solutions that can convert disparate manufacturing data into one common measurable form. 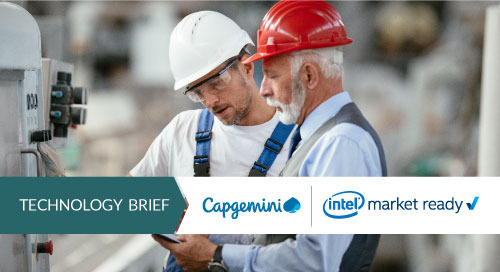 Tridium, a Honeywell Company, in collaboration with Dell and Intel®, developed the Niagara4 i4.0 Factory Optimization Solution to do just that. The system comprises a complete hardware and software stack designed to withstand the harsh conditions found in industrial environments. The solution incorporates the Niagara Framework—an open technology platform running on a ruggedized Dell Edge Gateway as shown in Figure 1. Figure 1. The Niagara solution makes it easier for manufacturers to deploy real-time analytics on legacy equipment data. The software can also automate remediation, helping correct problems as soon as they arise. For instance, on the factory floor, machine operators can view real-time data on a dashboard and immediately determine if their setup is properly aligned and that tolerances meet specifications. And managers can also see overall production data to know if they’re ahead of or behind schedule, and take action as needed to stay on track. Knowing this simple fact about their gas supply opened the eyes of management, enabling them to automatically adjust their manufacturing process and recipe to account for any variations in fuel quality. The outcome of this one discovery delivered an 89 percent increase in yield as well as a $2.5M savings in OpEx and more than a $2M cost avoidance in CapEx. The Niagara solution provides manufacturers with the ability to track and display KPIs such as Overall Equipment Effectiveness (OEE), Rolled Throughput Yield (RTY), and Cost of Poor Quality (COPQ). In addition, the solution can help them optimize workflow through visualization tools and smart digitized forms. Companies can also use the solution’s capability to process real-time and historical trend data, allowing them to accurately perform a variety of tasks, including detecting defects, tracing parts, and managing recipes. And given that data collection is an essential part of this cloud-agnostic solution, Niagara follows industry best practices for cyber security. This includes support for features such as strong hashed passwords, TLS v1.2 for secure communications, and certificate management tools for authentication. Niagara also uses open edge-to-cloud connectivity for a variety of uses, including sensors, programmable logic controllers, machines, and ERP systems. It also provides embedded edge analytics and an open-app environment that can help machine operators and factory managers become more efficient through actionable insights. The speed and short production runs—which are common to the low-volume, high-mix discrete manufacturing sector—can intensify errors if not rapidly corrected. By collecting and normalizing data created by an assortment of equipment and machines, manufacturers can finally gain real-time visibility into processes and operations on the factory floor and take swift remedial action.